Romney’s ads against defense cuts treat military spending as a jobs program. It’s Not Just a Job. It’s a Jobs Program. 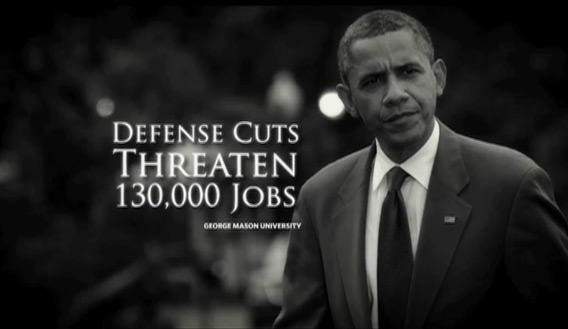 Romney’s ads against military cuts promise more jobs through government spending. Mitt Romney has launched a flurry of new TV ads explaining how he’ll protect and create jobs: more government spending. The ads, available on Romney’s YouTube channel, are tailored to eight swing states. The one running in Virginia, near me, says: “Here in Virginia, we’re not better off under President Obama. His defense cuts threaten over 130,000 jobs—lowering home values, putting families at risk.” Similar ads in other states complain that Obama’s reductions in military spending threaten 20,000 jobs in Colorado, 20,000 in Ohio, and “thousands more” in Florida and North Carolina. Romney promises to save these jobs by shielding the Pentagon budget. Here’s his pitch in Virginia: “Romney’s plan? Reverse Obama defense cuts. Strengthen our military, and create over 340,000 new jobs for Virginia.” The ad in North Carolina is identical, except that it adds 10,000 jobs to the offer. The ad in Colorado promises 200,000 jobs. The ad in Ohio promises 450,000. The ad in Florida promises 700,000. The jobs won’t all come from defense spending, of course. Romney also promises to “improve education and job training,” “provide alternatives to foreclosure,” and “stand up to China.” He doesn’t say how a trade war and more job training will solve the nation’s economic problems. Nor does he explain how these ideas square with his rhetoric about free enterprise, much less with his simultaneous pledges to cut taxes, repeal regulations, and eliminate the deficit. But he does assert that all of this will create millions of jobs. The Obama administration is set to cut defense spending by nearly a trillion dollars. My administration will not. Working together with my running mate, Paul Ryan, I will make reductions in other areas and install pro-growth policies to make sure that our country remains safe and secure. There are plenty of places to cut in a federal budget that now totals well over $3 trillion a year, but defense is not one of them. Romney wouldn’t just protect the military budget. He would radically increase it. He explicitly vows to set “core defense spending … at a floor of 4 percent of GDP.” This would require more government spending, regardless of need, just because the economy is growing. It’s hard to imagine a more socialist policy. The cost to our country over the next decade has been estimated at up to $2 trillion. Throwing $2 trillion at the Pentagon and its contractors certainly would create jobs. And setting GDP growth as a floor for future spending hikes would guarantee a perpetual boom in public-sector employment. But we already have a party that advocates that kind of stimulus. We don’t need another.